The hackneyed retort from the wind cult is that cars, cats and tall buildings kill more birds than their beloveds. Attempting to compare an utterly pointless power generation source – abandoned centuries ago for very obvious reasons, that wouldn’t exist without massive and endless subsidies – with automobiles and skyscrapers is risible. Motorcars and high-rise buildings both serve useful purposes, providing meaningful and independent mobility to the masses and permitting the high levels of urban density needed for modern cities. Whereas, wind turbines provide power in occasional, chaotic spurts – delivering power less that 30% of the time, at totally random intervals – require their entire generating capacity to be matched by dispatchable sources, such as coal and gas, and accordingly serve no meaningful purpose, other than harvesting endless subsidies. 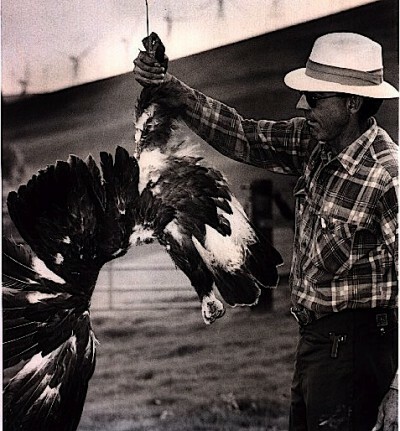 And for all the talk about cats killing more raptors than wind turbines, try and find a single verified account of a moggy bringing down a healthy Wedge-Tailed Eagle, Hawk or Kite. Now, as to the fate of such raptors, an Indian study has detailed the appalling scale of the wholly unnecessary carnage, and what it means for the ecosystem, as a whole. The news is particularly worrying as most wind farms are built on wide open plains and other environments where birds are typically found. These include wolves and lions on land, whales and sharks in the oceans and large fish in freshwater ecosystems. There have also been dramatic falls in populations of large herbivores like elephants and bison. The trophic cascade has moved down the food chain. 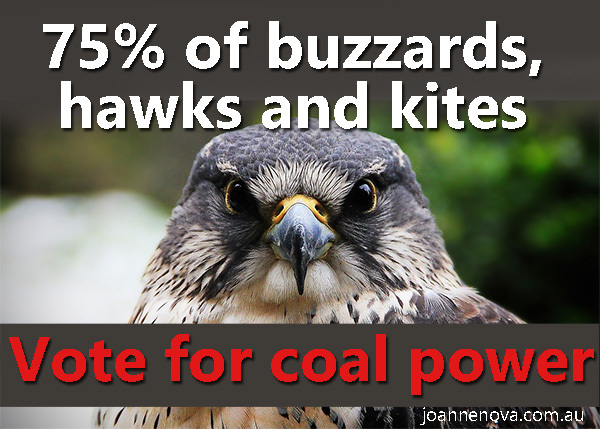 DO NOT VOTE for coal or even “clean natural gas”, a.k.a. Carbon Tetrahydride. CO2 is also Carbonic Acid Gas, which in the ocean can turn calcium carbonate shells into calcium bicarbonate, which dissolves in water. Result: dead coral reefs and dying oyster and clam beds. Global Warming is a FACT, caused by fossil carbon dioxide at 400 ppm capturing more infrared radiation than at its previous tens of millennia-long value of 280 ppm. The Deception is actually a romantic nostalgic DELUSION, that the SUN’s energy, which was slightly inadequate when fossil solar energy reserves (carbon and the oxygen to burn it) became the popular Industrial Revolution. Among other things, it made slavery obsolete. The only way to retain the benefits of that revolution is nuclear power, which the Fossil Carbon Industry, and NOBODY else, has reason to fear (and detest). Infrared radiation must necessarily escape to outer space to balance the energy of the solar radiation the planet receives. This is what cools the night-side part of the Earth, which is dark precisely because humans cannot see infrared. BTW, Leaks of methane (CH4) absorb far higher amounts of infrared radiation even than carbon dioxide. Vote instead for the decommissioning of the Nuclear Regulatory (or Refusal or Ruination) Commission. About Tim Ball and the BC Green Party. Free speech is good, and lawsuits are not the way to correct false statements. But Tim Ball is wrong about Global Warming, and most of the people with the effrontery to call themselves ‘green’ are as _green_ about fixing the problem as Polonius thought his daughter Ophelia was about Hamlet. Wind propelled generating devices (they aren’t turbines) are worthless not because the problem doesn’t exist, but because they cannot possibly fix it. The ridiculous thing about wind and solar in Australia is that if they were seriously intended as a way to reduce the rate at which the seas are being acidified and the CO2 content of the atmosphere going up (it used to be 280 ppm, and is now 400) there would be some attempt to cut down both on coal burning and coal mining. There is no sign of that, so wind turbines are not even intended to reduce CO2 emissions by non-living sources. Coal is filthy, but nuclear is far cleaner than anything else. The infamous Chernobyl “disaster” killed fewer people than wind turbines have since then. Air pollution from coal, in a year, kills more people than that, but possibly fewer raptorial birds. We DO need to get rid of coal, AND “natural” gas, and Nuclear is what we need. I’m anti-wind-power but how do you arrive at that claim? Long term exposure to radiation is said to have killed tens of thousands in the region. Wind turbines are mainly killing scenery and wildlife, along with health effects on people, as well from toxic rare earth mining impacts (akin to slow deaths from radiation). Let’s stay realistic with facts if “these things” are to be stopped. Noting you can’t put a figure on the number of radiation deaths actually caused by the Chernobyl incident, here’s some ‘realism’ for you. Despite the hysterical overreaction to the Fukushima incident – a result of damage caused when a monster tsunami knocked out the power plant’s power supply – not one single soul was lost during the incident or in the 5 years since. Compare that fatality free “disaster” with the number killed and wounded by the wind industry. The wind industry has been flapping about for not much more than 20 years (producing a trickle of unreliable power, even today) and has killed more than 180 people – including the two Dutch wind turbine mechanics incinerated by a self-immolating Vestas, depicted above. 112 were wind industry and direct support workers (divers, construction, maintenance, engineers, etc), or small turbine owner/operators. 72 were public fatalities, including workers not directly dependent on the wind industry (e.g. transport workers). 17 bus passengers were killed in one single incident in Brazil in March 2012; 4 members of the public were killed in an aircraft crash in May 2014 and a further three members of the public killed in a transport accident in September 2014. This includes several suicides from those living close to wind turbines. Contrast that with nuclear power, which has been a serious power generation contender for over 50 years and (in a single accident at a military facility, Chernobyl) killed 56, most of whom were fire or rescue workers (see our post here). And, unlike wind power, nuclear power just works: without backup, pumped hydro, mythical mega-batteries and the like. To STT: I stand corrected. I was going from several worst-case theories that were popularized and assumed to be true. But nuclear will always make people uneasy because of its war legacy and the potential for terrorism. It’s far from harmless in the wrong circumstances. The new compact reactors that can be buried underground with little or no maintenance seem like a portable alternative to wind power. Still, anything less than nuclear fusion is based on finite resources, which is the predicament that quasi-renewables aim to solve. No proof exists of abiotic oil, etc. We should be burning as little as possible but it’s being treated as a money-based commodity with consumption rising and falling on current prices, not long-term wisdom. Dear “Respect Silence” this reply started as a response to your quoting estimates of long term deaths from the Chernobyl management blunder. They did what was specifically warned against in the operations manual. 28 brave emergency workers died of acute radiation traumas. UNSCEAR estimates the actual and likely cancer deaths at from 40 to 140. I note that you have been informed of the fearmongering and lies about Fukushima-Daiichi. Wildly exaggerated guesses from the anti-nuke brigades have been made on the basis of the counter-factual LNT conjecture (Linear No Threshold) All living organisms have defenses against chromosome damage regardless of what causes it. It turns out that low levels of nuclear radiation, just like solar UV (which CAN be fatal) induce a corrective response. Oddly enough, the levels of “natural” radon exposure in the Rocky Mountains, which are higher than the level at which EPA and others, using the LNT hypothesis, warn against, seem to be associated with a lower level of lung cancers than the places which are exposed to lower levels of this ferociously radioactive gas. This is called “hysteresis” and resembles, vaccine response, or even response to very low injections of snake venom. It apparently alerts the repair response of the body. Who needs birds anyway??? They just clutter up the skies. Andreas, “abandoned for obvious reasons” hits the nail upon the head. My Facebook profile picture is a copy of part of Turner’s “Fighting Temeraire being tugged…” by a dirty little coal burner. But we, including Australia, need to be rid of coal, gas, and petroleum burning. That can even be expressed more compactly as carbon and hydrocarbon burning. Russia, China, and South Korea are taking the problem seriously. They do not have ignorant (or malicious) pseudo-environmentalists like the Sierra Club and too many of the California Democrats. Nor do they have Koch Brothers nor Loy Yang. My own electricity supplier, Dominion Power, gets over 45% of the energy it provides, emission-free, from reactors of the Rickover-era PWR type, which environmentalists who are uninformed or “moles” of the fossil carbon and “RE” industries erroneously charge with killing people. There is ZERO evidence of that accusation. Nobody died at the reactors either at TMI or at Fukushima-Daiichi. Those who died of being separated from their homes in Fukushima, by the government or their own fear, were victims of ignorance, not radiation. The infamous Chernobyl was a different kind of reactor, with a known instability and standard operating instructions to prevent it, which were ignored. Immediate deaths of emergency workers totalled 28, and about 40 people definitely died of cancer from radioactive iodine release, which could have been prevented by administration of potassium iodide, except that Soviet authorities tried not to let the news of the meltdown be broadcast. Talking about man causing the decline of apex predators, there’s a fascinating story about the re-introduction of wolves into Yellowstone National Park in 1995, after the last ones were killed off in the 1930s. Reintroduction of the wolves transformed the ecosystem AND the rivers. Evidence from South Australia’s own Environmental Protection Agency indicates departments are not only ‘compromised’. In fact they provided a vocational recruitment pathway for the Wind Industry.